I’ve only very recently become the kind of person who reads the NY Times Sunday Book Review. Before this, I had always found my books in a very haphazard, but still pleasantly random kind of way. Now I read reviews. I try to follow what’s new and exciting. Actually it’s taken some getting used to; it’s a little unsettling to be aware of books when they come out (or before) as opposed to picking up a stray paperback from a pile in a store. Moreover it’s not healthy for my book buying habit – because, for me, to be aware of the new hardcovers is to buy them. This title, for obvious reasons, was initially off putting. But I did actually read the review and when I realized who wrote it, a whole new world opened up. 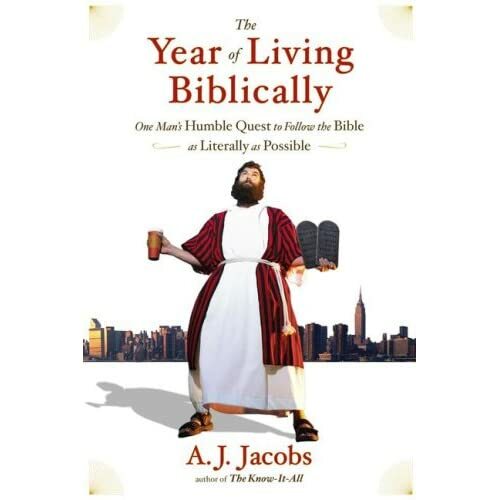 I read Jacob’s last book Know it All and my only regret is that I am not as smartly funny as he is. I’ve come to believe that he could write about just about anything and make me laugh at loud (similar to how Mike Rowe makes even germs look good on his TV show Dirty Jobs). Of course reading Matt Labash and A.J. battle it out biblically on Slate.com has only heightened my desire to read this book. Like right now. But I’m holding out for the library to gets it. Or maybe I’ll ask for it for Christmas (that would be ironic). Or maybe just until I break down and spend the money to get it.